A crew member of the HMS Albion, the British Royal Navy flagship amphibious assault ship, is seen upon the ship's arrival at Harumi Pier in Tokyo, Japan, Aug. 3, 2018. A British amphibious warfare ship passed through the South China Sea in August and China, Asia’s strongest military power with a claim to almost the whole waterway, expelled it. Now the European country with a once powerful colonial foothold in Asia wants to set up a new base in the region, according to news reports citing the British defense secretary. More likely, Asian political experts say, it will let the U.K. challenge China’s influence — and get challenged back — in the resource-rich sea by helping British ships join allied American vessels for periodic naval exercises. Britain alone lacks the money and must mind relations with former colonies in Southeast Asia, they say. Maps showing the claims of six Asian countries contesting all or parts of the Spratly and Paracel islands in the South China Sea. FILE - Photo provided by the U.S. Navy shows the guided-missile destroyer USS Decatur (DDG 73) operating in the South China Sea as part of the Bonhomme Richard Expeditionary Strike Group (ESG), Oct. 13, 2016. “China would of course object heavily, but I think for the rest of Southeast Asian countries it’s not something new,” said Oh Ei Sun, senior fellow with the Singapore Institute of International Affairs. HMS Albion, the British Royal Navy flagship amphibious assault ship, arrives at Harumi Pier in Tokyo, Aug. 3, 2018. 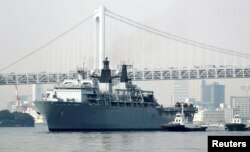 In September, Beijing treated the single ship, the British navy’s HMS Albion, as an intrusion into Chinese territory. 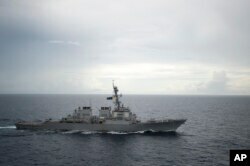 The vessel “entered China’s territorial sea without the Chinese government's approval,” Chinese state-controlled media outlet Gbtimes.com reported, citing Foreign Ministry spokeswoman Hua Chunying. Britain may be planning the base to expand into Asia strategically and economically “as an independent actor” after leaving the European Union, said Carl Thayer, emeritus professor at the University of New South Wales in Canberra. The UK has named Singapore and Brunei as candidates for a base, The Telegraph says. “There is always a domestic element to it for the host country,” said Collin Koh, a maritime security research fellow at Nanyang Technological University in Singapore. “Basically it would impinge upon perceptions of sovereignty, for example, and the fact that people will start to question the government whether it will allow in foreign presence to sort of subvert our foreign policy,” he said. 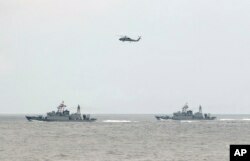 FILE - A Taiwan Navy helicopter flies over two Taiwan made corvettes during a navy exercise in the bound of Suao naval station in Yilan County, northeast of Taiwan, Apr. 13, 2018. “We respect any country to exercise its rights of freedom of navigation in the South China Sea, and we are open-minded about these issues as long as it helps to maintain peace in this region,” she told reporters on Saturday.